The liver is a very useful by - product that contains many vitamins, amino acids, enzymes and minerals. The liver of a Turkey contains large amounts of folic acid, very young children, pregnant women and people who are prone to atherosclerosis and diabetes. Recipes using liver Turkey a lot in different cuisines of the world. 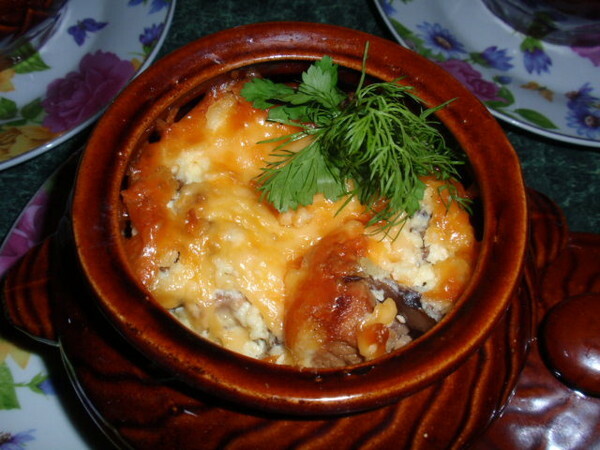 Livercooked in pots with vegetables in sour cream and wine sauce under a cheese crust turns out very tender and flavorful. Onion peel and shred half rings. Carrots clean and cut into cubes or strips. Celery peel and cut into too cubes or strips. Potatoes should be cleaned and cut into cubes. Liver rinse, remove the film and cut into pieces a La carte. Roll the liver in starch. Fry the liver on high heat in oil for 2-3 minutes. Pan spasseruyte onions and carrots. After the onions become transparent, add celery and potatoes and sauté on high heat for 2-3 minutes. Half of the vegetables put them in the pot. Lay the liver on vegetables. Liver put the rest of the vegetables. Mix the wine with sour cream until smooth. To the sauce add salt and pepper. Pour the sauce over the vegetables with the liver. Top the dish with grated cheese. Bake the dish in the oven at 180 degrees for 40-45 minutes.